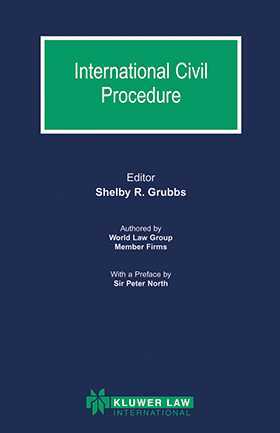 International Civil Procedure is a desk reference for lawyers and their clients faced with the prospect of litigation in foreign jurisdictions, this book will act as a guide to the civil procedure, rules, and practices in thirty-two major countries and in the European Community, as well as provisions regarding local rules relating to arbitration and, where available, mediation are also covered. The title is designed primarily to orient a litigate and its domestic lawyer so that they can determine the probable course of litigation and, once they have retained foreign counsel, ask more intelligent and relevant questions. The World Law Group is a network of independent law firms located in most of the world's major commercial cities. Each World Law Group memebr firm has been selected for its excellent business reputation, its dept of commitment to international practice and its ability to assist other member firms in their national dealings. For more information, please visit http://www.theworldlawgroup.com. Countries covered: Argentina, Australia, Austria, Belgium, Brazil, Canada-Common Law, Canada-Civil Law (QUebec), Den mark, England and Wales, Europe, France, Federal Republic of Germany, Hong Kong Specal Administrative Region of the People of China, India, Ireland, Israel, Italy, Japan, Korea, Malaysia, Mexico, The Netherlands, Norway, Portugal, Scotland, Singapore, South Africa, Spain, Sweden, Switzerland, Taiwan, United States.